e-con Systems Inc., NVIDIA’s Preferred Partner, a leading embedded camera solution company, announced the launch of Multiple 4K camera support for NVIDIA Jetson TX1/TX2 – e-CAM130_TRICUTX2. Being a preferred partner of NVIDIA, e-con Systems is coming up with various camera solution supports for NVIDIA TX1 and TX2 processors. 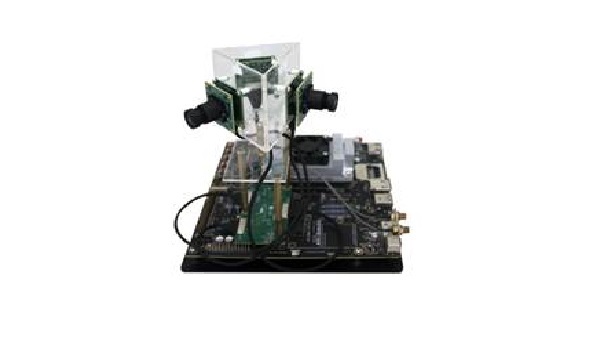 e-CAM130_TRICUTX2 is a multiple camera solution for NVIDIA Jetson TX1/TX2 developer kit that consists of three 13MP 4-Lane MIPI CSI-2 camera board and a base board to interface with the J22 connector on the Jetson TX1/TX2. Each camera is based on the camera module e-CAM137_CUMI1335_MOD, 1/3″ AR1335 color CMOS image sensor from ON Semiconductor and integrated Advance Image Signal Processor (ISP). All these three cameras are connected to the base board using customized Micro-Coaxial cables. To ensure the sturdiness of the system, e-con Systems has designed a very flexible 30cm long Micro-Coaxial cable with connector locks at both ends, allows customers to connect both camera boards and adaptor board with no trouble. Nvidia Jetson TX1/TX2 has support for three 4-lane MIPI CSI-2 interface. e-CAM137_CUMI1335_MOD can stream uncompressed video 4K @ 30fps. The TRICamera, supports up to 3 simultaneous synchronized 4K @ 30fps streams. That allows wide range of application can be built on top of it. Some of the applications are ADAS, 360-degree camera, Multimedia applications, 3D video recorder, Agricultural application, Drone, Deep learning and so on. The e-CAM130_TRICUTX2 is currently available for evaluation. Customers interested in evaluating the e-CAM130_TRICUTX2 can order samples from e-con Systems’ online store.